Did Santa (or perhaps Chanu-klaus) bring you a new PC this year? That's great! You must have been a good little user. While I'm sure you're eager to start using the new system, it's worth taking a little time to "hassle-proof" it first. Step one: Create a system repair disc. See, you never know when some catastrophe will strike your PC, rendering it unable to boot. And because few vendors these days bundle actual operating-system discs, it's up to you to build a bootable CD or DVD that can help save the day. Thankfully, Windows 7 makes this quite easy. Just click Start, type repair, and then click Create a System Repair Disc. Pop a blank CD or DVD into your drive (netbook users will need to connect an external one), click Create disc, and then sit back while Windows gets to work. When it's done, label the disc, file it away, and hope you never need it. 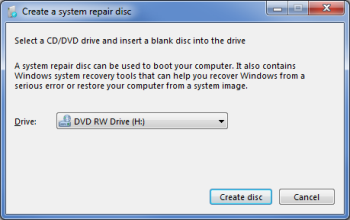 If you do, you can boot the disc to load a basic repair environment with diagnostic tools and System Restore. The important thing to remember is that you can't do this after a problem has occurred; you need to create your repair disc ahed of time. So take 10 minutes and do it right now. At some point in the future, you may be awfully glad you did.